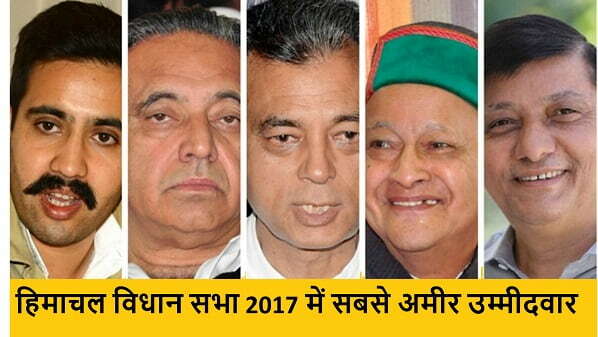 Himachal Pradesh elections are going to held on Nov 9 and resuls will be out on December 18th 2017. Currently in State there is vribhadra singh government. Here is the list of Richest candidates fighting in upcoming elections 2017. Virbhadra singh's Son and Congress Candidate from Shimla Rural Vikramaditya singh Bushehr tops the list with assets totalling around Rs. 84.32 Crores. There are many politicians of congress party out of top 10 in crorepati's in upcoming elections. Pritvi Vikram Sen is independent candidate from Vidhan Sabha Constituency Kusumpti, Shimla. Prithvi Vikram Sen is brother in law of Chief minister candidate of Congress party Virbhadra singh and scion of Junga Royal family. He owns commercial buildings. ` will be against current MLA from kusumpti and congress candidate Anirudh Singh and vijay jyoti sen of Bhartiya Janta Party in upcoming elections. Prithvi Vikram Sen declared assets of around 6.85 crore Rupees. Anirudh singh is current MLA from Kusumpti constituency and he belongs to a royal family of Koti. Anirudh and his family members have stakes in Hotel and Education business. He will be against Independent candidate and brother-in-law of CM virbhadra singh and BJP candidate Vijay Jyoti sen.
Anirudh Singh declared total assets of around 16.22 Crore. Maheshwar singh belongs to Kullu Royal Family, and declared his total assets around 18 crore rupees. Maheshwar singh belongs to Bhartiya Janta Party and before this he was founder of Himachal Lokhit party. He is currently BJP candidate from Kullu constituency. He is king of kullu and owns his own palace and land in Kullu. He will be against Surender singh Thakur of Bhartiya Janta Party. Prakash Rana is an independent candidate from Jogindernagar constituency and declared assets around Rs. 20.8 Crore. He is a businessman and owns his land in Kharar, Mandi and business in Dubai. He is against Gulab singh Thakur of BJP and Jiwan Lal Thakur of Congress party. Ashish Butail is son of Brij Bihari Lal Butail, he is fighting as a candidate of Congress party from Palampur constituency. Ashsih Butail is a youg leader and taking his family legacy forward. His father was Richest candidate in Last elections of 2012. Ashish butail will be against Indu Gauswamy of BJP in upcoming elections. He declared his total assets around Rs. 21.0 crore. Rajinder Rana is businessman and social worker, he is member of congress party and candidate from Sujanpur vidhan sabha constituency. Rajinder Rana is a reator and owns property in Punjab and himachal Pradesh. Rajinder Rana will be against former chief minister of Himachal Pradesh Prem Kumar Dhumal. Remember Prem kumar Dhumal is also chief ministerial candidate of BJP party in upcoming elections 2017. Rajinder Rana declared hsi assets around Rupees 26.7 crore. Chief minister of Himachal Pradesh Virbhadra Singh declared his total assests around Rs. 30.5 crore. Virbhadra singh is Six time chief minister of Himachal Pradesh and chief ministerial candidate of congress party in this election. Virbhadra singh is congress candidate from Arki vidhan sabha seat as he left his safe seat of Shimla Rural for his son. He will be against Ratan Singh Pal of BJP. Virbhadra singh belongs to a royal family of Bushehr. He declared his total assets around 30.5 Crore rupees. Anil Sharma of BJP declared his total assests around 37 crore rupees. Anil sharma is son of former congress leader and former union minister Sukh Ram who recently joined Bhartiya Janta Party. Anil sharma is contesting from Mandi Vidhan Sabha and he will be against congress candidate Champa Thakur daughter of State minister Kaul singh Thakur. Transport minister of Himachal Pradesh and senior leader of congress party GS Bali declared total assets of around 47.67 crore rupees. GS bali is congress candidate from Nagrota. He owns mall, hospital and hotel. GS bali will be against Arun kumar of BJP. Vikramaditya Singh is richest candidate in this elections , with total assets of around 84.32 crore rupees. Vikramaditya Singh is son of Chief minister virbhadra singh and yuvraj of Royal family of Bushehr. Vikramditya own lands and gardens of Apples, and property in out of state also.